SignatureCare Stafford Emergency Room Now Open! Hospital ER Level Care- Without the Wait. 10 Mins or Less wait times. SignatureCare Emergency Center in Stafford, TX is located at 3531 S. Main Street, Stafford, TX 77477 (Hwy 90 and Murphy Rd.) You will always be seen by one of our board-certified emergency room physicians when you visit any of our emergency rooms. We serve residents in the Alief, Sugar Land, Richmond, Rosenberg, Pearland, Stafford and other communities surrounding 77477 zip code including Greater Fondren Southwest, Westbury, Chinatown, Missouri City, Sharpstown and Quail Valley areas. Our Stafford emergency room operates like a hospital ER, except we have little to no wait times, and you will always see a board-certified doctor. 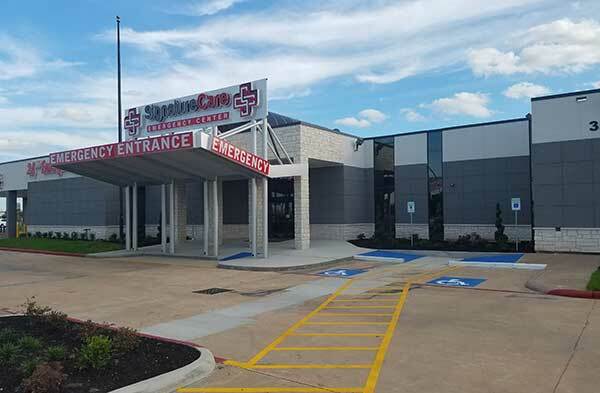 SignatureCare Emergency Center – Stafford TX is a freestanding 24-hour emergency room. Our ER is furnished with modern upscale fixtures, equipped with a medical lab, and provides x-rays, CT scans, and other imaging on-site. At SignatureCare, diagnosis and treatment are faster when you have a medical emergency. There are many reasons to make SignatureCare Emergency Center in Stafford, TX your first choice for medical care. All our emergency centers are equipped with onsite laboratories and technologies that assist our board certified physicians in completing comprehensive medical exams – with most tests completed while you wait. This also means that patients in our emergency centers don’t have to search through a huge medical hospital or wait hours. They can access all of our medical services in one convenient emergency room. Our ERs are freestanding emergency rooms and function exactly like a hospital based ER except without the long wait. Why wait for hours when you don’t have to? Call, Schedule or Walk in, anytime, 24 hours a day. Medical care for all age groups- Kids and Pediatrics Emergency care and treatment. Emergency Dental care when your dentist’s office is closed. We treat infections and pain 24 Hours a day. We accept most insurance plans. Call if you have questions, schedule or check in online or simply walk in any time to any of our locations. Dr. Habacuc Garcia is board-certified in Emergency Medicine and serves as the Medical Director of SignatureCare Emergency Room in Stafford, TX. He earned his medical degree from UTMB Galveston and completed Emergency Medicine training at Lincoln Medical Center in Bronx, NY. He has over 10 years of clinical experience working at Memorial Hermann Southwest where he served as chair of Pharmacy, Credentialing, and Trauma Committees. Dr. Garcia is passionate about provider education and patient advocacy, and hopes to continue to serve his community through SignatureCare.